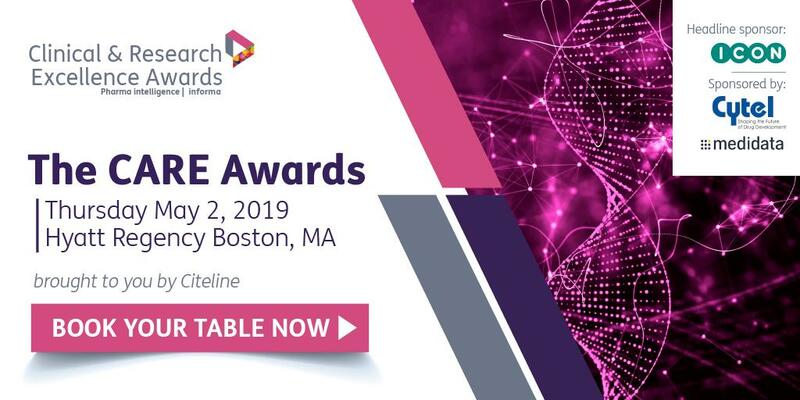 The CARE Awards, brought to you by Citeline, return to Boston on Thursday, May 2, 2019 at the Hyatt Regency Boston. The Awards were created to recognize myriad accomplishments across the biopharmaceutical industry, providing an opportunity for the industry to honor its highest achievers. Achievements across the spectrum of key R&D activities are celebrated, from successes in early and late-stage research, to advances in technological tools, to innovations in trial design and execution. Join us at this special event, as we applaud the unsung heroes who work hard to ultimately make human lives better. The CARE Awards return to Boston on Thursday, May 2, 2019 at the Hyatt Regency Boston. The CARE Awards, powered by Citeline, gather distinguished leaders in the biopharmaceutical, CRO, and diagnostic industries from all corners of the globe. Don’t miss out on drawing recognition to your successes. Take the spotlight by sponsoring a category, or benefit from one of our other sponsorship packages at CARE 2019. There can only be one sponsor per category, so talk to us today! Since their foundation in Dublin, Ireland in 1990, ICON's mission has been to help our clients to accelerate the development of drugs and devices that save lives and improve quality of life. They do this by delivering best in class information, solutions and performance, with an unyielding focus on quality at all times. Oracle Health Sciences provides the only eClinical platform made up of best-of-breed solutions powered by the #1 data and cloud technology in the world. With Oracle Health Sciences, Life Sciences organizations can manage and unify all elements of the Clinical Development Lifecycle in a safe, secure and compliant manner, while also being open, collaborative and adaptive to change.